This vintage dress comes with the easiest instructions ever: pull on, look amazing! This is the PERFECT effortless outfit! Gingham lovers will adore this black gingham dress, as well as anyone who loves an outfit that combines both comfort and great style. This perfect layering dress is a take on our Original Layering Dress, minus the ruffled sleeves. Wear it under blazers, jackets, cardigans, scarves, or vests to create an infinite number of unique outfits. 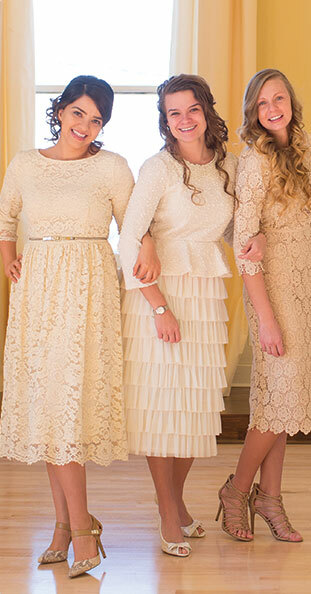 Once this dress is part of your wardrobe, you'll wish you could wear it every day! Completely modest and made of the softest high-quality Pante Roma knit fabric. This versatile dress is an essential basic item for every modest closet -- a summertime must-have. Comes in two lengths. Side Zipper Closure. I absolutely love this dress! It's incredibly comfortable and the fabric has great stretch. The fabric weight and print are great for year round! I purchased the maxi length of this dress. I love it!!! It’s very comfortable and easy to dress up or down. This dress is so cool to wear. I receive so many compliments when I do. It looks navy blue and white in the picture to me, but it's actually black, white, and gray. I've work it with a black belt and pumps and with a red belt and red shoes. Both looked really nice. This has become one of my go-to dresses. This piece is so easy to dress up or down, and is appropriate for every season!!! Very comfortable. The excellent double lining makes it a little heavy--keep that in mind if you reside in a warmer climate. This dress is super cute! You can dress it up or down. Can't wait to wear it! I purchased this lovely piece at a DJ sale in Alabama!! It fits true to size and is very comfortable and flattering. I love that it has a concealed side zipper.